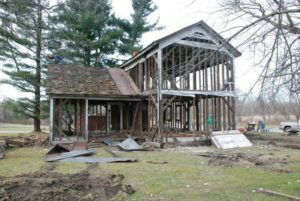 Where others see an abandoned house, builder Dan Troth sees an important piece of American history worth saving. 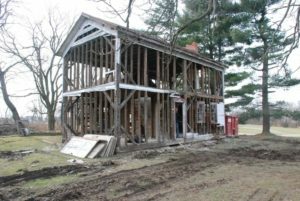 Troth stumbled upon a 19th century timber frame farmhouse outside of Columbus, Ohio. He promptly set out to preserve the hand-hewn timber frame by using it in a new and green home. Troth meticulously disassembled the home, carefully documenting the pieces for reassembly. 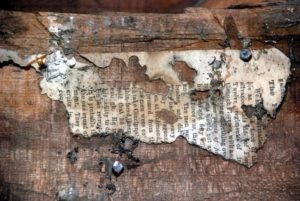 During disassembly he found a newspaper inside a wall cavity. Placed in the wall during the home’s original construction, the paper chronicled a Civil War battle from 1862. 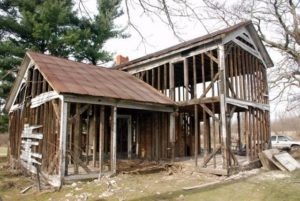 Troth soon met a couple interested in incorporating the antique timber frame into a new home. Troth and architect Todd Parker, F5 Design, began working. Entirely enclosing the 6,000-square-foot home? Insulspan® structural insulated panels (SIPs). The Insulspan® SIP System creates an airtight building envelope, helping the homeowner save energy and reduce their carbon footprint. As an avid green home builder, Troth also plans to outfit the home with other energy saving features, including a geothermal heating & cooling system, tankless hot water heaters, and a heat recovery ventilator that provides ventilation without heat loss. Parker said in addition to reducing energy use, the Insulspan SIP System was ideal for enclosing the timber frame structure. Using SIPS for the roof instead of more commonly used attic trusses, means the family benefits with a finished third floor living space. The homeowners chose to create a large guest room with a full bath on this bonus level. Although Parker admitted this project was not something he encounters every day, he sees the benefits of using SIPs on future projects. Troth, who has been building with SIPS since 1988, prefers to work with them exclusively. “The energy efficiency is a huge reason to use SIPs and one of the main reasons more people will convert to them in the future,” said Parker.